Announcing the Joyland Online Casino! Gambling World is Proud to Present Joyland Casino! Besides the fact that the games are exciting and just plain fun, it's also good to know that the Joyland games have extremely high percentage payouts as well. The games included in the free download are offered at full screen with high resolution. Just like any casino you have your choice of dozens of slot machines, video poker and a full line of table games such as blackjack, both American and European Roulette, Craps and more. They also offer a Live Version of a few games with Live Dealers such as Blackjack, Sic Bo, Roulette and Baccarat. 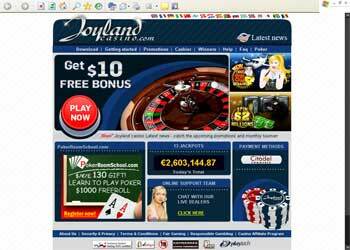 Operating for a number of years now, Joyland has grown to be a well respected Online Casino. Their Customer Support Crew is available to answer any questions visitors or players may have and are available any time by email or toll free phone. There is also a Live Chat option for those who prefer to speak directly with support online. Players have currency options as well. Currently you can choose between US Dollars, Euros or Great British Pounds when opening your account. All new players are offered a 30% Bonus for their first deposit. Just create an account and make your first deposit of $/€/£20 or more and you qualify for the 30% bonus of up to $/€/£ 300 Free. They also offer an exclusive big bonus for the larger players. For initial deposits of $/€/£5000 or more they offer $/€/£850 bonus along with automatic enrollment in the VIP Club. For an extremely Limited Time, Joyland is offering a No Deposit Bonus of $10 or 10€ or £5 FREE. Hurry as this offer may be withdrawn at any time.